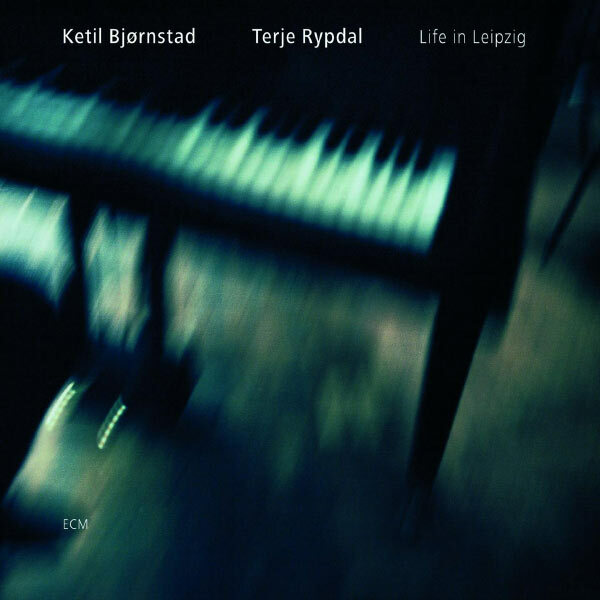 Pianist Ketil Bjørnstad and guitarist Terje Rypdal present a parallel universe to the former’s duo recordings with cellist David Darling. Despite having performed with Rypdal more than any other musician, Bjørnstad makes here his album debut with Rypdal as a duo. Recorded live at Leipzig’s Opera House in 2005, this document finds both musicians unmasked and in prime lyric form. They are also more focused and impactful in their playing, needing only to listen to each other and to the muses guiding them to sing. With a Bösendorfer piano at his fingertips, Bjørnstad elicits a heavier sound not heard on previous projects. “The Sea V” thus begins the set in rather dark territory for Bjørnstad, whose lyricism tends to skim the waterline. Only now it scours the ocean floor, a ghost from some ancient wreckage clawing silt and coral into musical rebirth. The pianism gradually turns into sparkle, while Rypdal’s fire remains untainted by the waves—if anything, enlivened by them. Thus the album offers its first of a handful of reprises from The Sea, including also Nos. II and IX. Both overflow with aching nostalgia, the mode of speech between the duo so heartwarming that you’d swear you’ve heard it before, even if for the first time. The latter tune treats us to some rare strumming from Rypdal for a webbed, Bill Frisell-like effect. Other tracks link back to further group collaborations. From Bjørnstad’s Water Stories we get the utterly fragile “Flotation And Surroundings,” for which Rypdal’s subdued, mid-heavy whispers bob like petals on water, while Bjørnstad dips into some crisp, jazzy playing that takes a page out of Keith Jarrett’s vast book. This in turn elicits from Rypdal a crispness of his own as he carves out a fiercely melodic solo. “By The Fjord” comes by way of The Light. Originally written for voice, it gains even truer vocal quality by virtue of Rypdal’s introspection. His is a physiological bed made up in sheets of gold. The guitarist’s own Skywards gets props with “The Pleasure Is Mine, I’m Sure.” There or here, it is a luscious and soaring thing, equal parts muscle and fragrant breeze. Two references to If Mountains Could Sing also put Rypdal in the spotlight. The overlapping guitars of “Le Manfred / Foran Peisen” whip up a fiery solo replete with grungy delays. This is a profound moment in the program, and a bursting foray into Rypdal’s cosmology. Fan favorite “The Return Of Per Ulv” closes out the concert in a spirited version. This has a different quality with only a piano to back it. One can almost see it relegated to the corner of a nondescript tavern, even as it blasts its message across tundra and sand. Rypdal’s soloing takes this one to new heights…and depths. Three standalones round out the set. “Easy Now,” excerpted from Rypdal’s Melodic Warrior, receives an astonishing treatment. Rypdal navigates its chordal landscape with his eyes closed and his pick telepathically attuned to every change in wind. And a fragment of Edvard Grieg’s “Notturno,” a short piano solo with slightest shadows, shifts into a short piece by Bjørnstad entitled “Alai’s Room,” another solo so pretty that might have upset the balance had it been any longer. It offers just enough reprieve. Even at its most sensitive, the duo maintains an epic quality to its playing. About as good as it gets from either man, and a sheer joy to have them—and no one else—together at last.